Living a Fit and Full Life: Make Healthier Popcorn at Home with Ozeri's Movie Time Popcorn Maker! 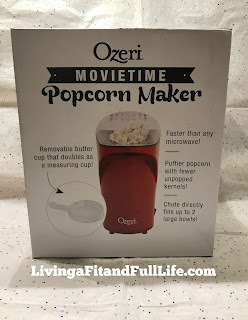 Make Healthier Popcorn at Home with Ozeri's Movie Time Popcorn Maker! Make healthier popcorn at Home with Ozeri's Movie Time Popcorn Maker! I love popcorn, like seriously love popcorn so this Ozeri Movie Time Popcorn Maker makes me extremely excited. I love that I can pop my own popcorn at home without the use of a microwave or those greasy popcorn bags. Ozeri's Movie Time Popcorn Maker pops popcorn in seconds without the use of butter or oil so you can enjoy a low calorie snack in minutes. One reason I really like popcorn is because it's so versatile. You can eat it plain, add butter and salt, cheese or even sweeten it up a little with some chocolate and drizzle it one top. Popcorn is one of my go to snacks when I'm craving something sweet or salty because it's incredibly easy to make either, especially with the use of this Ozeri Movie Time Popcorn Maker. 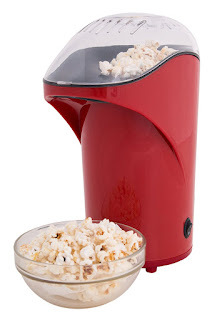 Ozeri's Movie Time Popcorn Maker pops just about every kernel and I absolutely love how fluffy the popcorn is. 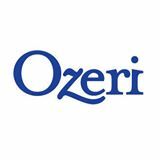 Ozeri's Movie Time Popcorn Maker is a wonderful product and I highly recommend it!